One of the best thing about writing crime fiction is meeting other writers. Crime writers are an unusually convivial lot and at conferences I always find myself chatting to interesting people as well as meeting old friends. At Crimefest in May I shared a table at the Gala Dinner with Danish writer, Dorte Jacobsen, and her husband. Ever since I’ve been following her blog at djskrimiblog.wordpress. com. 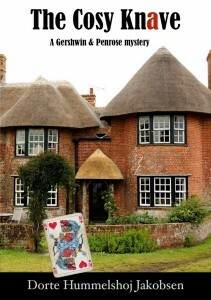 As she’s recently published a novel, THE COSY KNAVE, I asked her for an interview. I write in different subgenres, but I believe the title and cover indicate that “The Cosy Knave”, the first volume in a planned series about Rhapsody Gershwin and Archibald Penrose, is totally cosy. There are murders and assault aplenty, but not the kind that give you nightmares.Besides, it is full of humour and people with funny names (Cadbury ought to sponsor it as it tends to make British readers yearn for candy or biscuits). 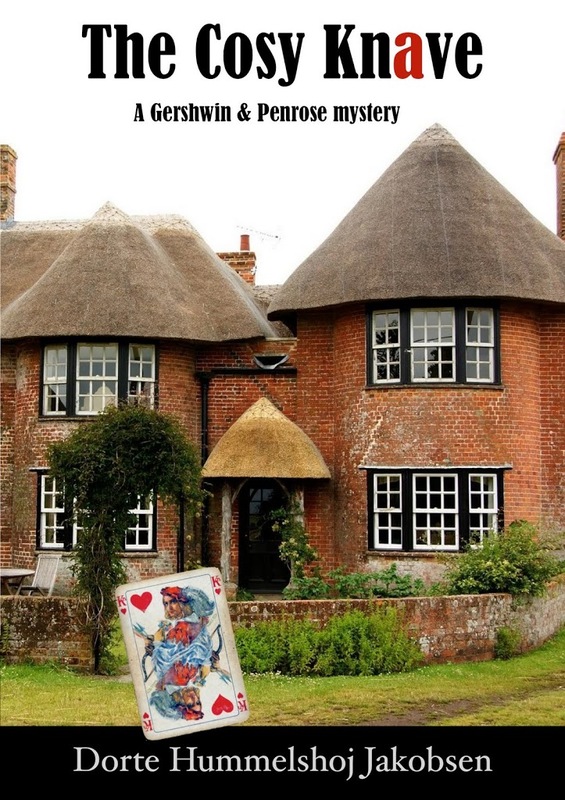 I have done my best to write the kind of cosy mystery I like to read: credible characters, an idyllic village setting and a proper puzzle which leaves the reader guessing who did it and why all the way through. It depends on the subgenre. For thrillers or police procedurals the plot may matter more to me, but I don´t think a cosy would work without a fairly close-knit, small-scale community. “The Cosy Knave” takes place in ´Knavesborough´, a village which is loosely inspired by a real town in Yorkshire, and it seems to me that most of the cosy series are firmly based in those ´good old days´ we always talk about but which never really existed. I hope to be able to finish “Crystal Nights”, a somewhat darker mystery which takes place in Denmark in 2012, but after that I have ideas for the second and third volumes in my cosy series. I have never been short of ideas, all I need is time to write all those plots that addle my brain. The series “The Killing” has been hugely popular here, but we don’t know much about Danish crime-writing. Can you recommend anyone whose work has been translated into English? I am really glad to get this question now and not a year or two ago. Two of my favourite series have been translated recently. First, “The Boy in the Suitcase”, written by Lene Kaaberbøl and Agnete Friis, was published in the US this year. It is a brilliant story about a protagonists who struggles far too hard to save the world so I am sure it will also reach Britain before long. Second, Jussi Adler-Olsen’s “Mercy” was published in Britain a couple of months ago, and it seems that English readers enjoy Carl Mørck and his oddball sidekick as much as we do. Both series are strongly recommended, every bit as good as the best Swedish and Norwegian crime novels.